I love playing in the kitchen. Trying new ideas, techniques and recipes keep meals exciting and helps me write up new blog posts. Yet, there’s something comforting with the familiar and well-worn. 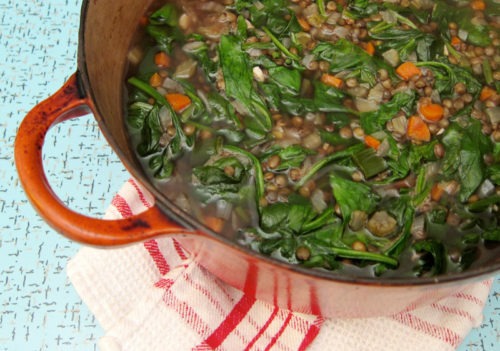 This lentil soup is a very well-worn recipe. I transcribed it onto a blank page of my soup-splattered Moosewood cookbook years ago and I make it often. The recipe comes from an old boyfriend – but not a boyfriend of mine. When I first moved to Vancouver almost 15 years ago, I made the move from London, Ontario with a good friend and we became roommates. Her first Vancouver boyfriend made this soup one Saturday afternoon and I was instantly smitten – with the soup, not her boyfriend. Prior to my first bowlful, I had never had lentil soup before and looking back, that tidbit kind of blows my mind. I was vegetarian at the time and cooked with tofu, beans and I practically lived on soup. One of my favorite dishes was a spicy kidney bean and lentil stew, so why I had never thought to turn lentils into soup is a stumper. I was so thankful to have this soup in my repertoire and I made it constantly. It was an inexpensive meal to prepare – I used a couple cans of brown lentils, a couple of bullion cubes, and it would last for many a meal. I was drawn to its cheapness which was good since I was working for minimum wage in a record store while paying off my hefty student loan debt, amongst all my other expenses. But I loved how this soup tasted, especially when I was flush and could grate an unhealthy load of old cheddar cheese over the top of my bowl. And despite all the years, this soup is as welcome and comforting as a pair of slippers. I now sub in French lentils du puy for the canned variety and have added in carrots for colour, but it still tastes as good as it did way back then. It’s certainly not fancy, but when you can have a huge pot of tasty homemade soup in about half an hour, how can you complain? Especially with grated cheese overtop. In a large pot combine stock, lentils, onion, celery, carrots, garlic and chili flakes and bring to a boil. Simmer until lentils and vegetables are tender, about 20-30 minutes. Add in spinach and add in salt and pepper if necessary. Simmer for another 5 minutes. Serve and sprinkle with cheese, if desired. There really isn’t anything better to stave off the late-winter blues with than a hearty bowl of lentil soup. I’ve never used canned ones before, but it sounds like an easy way to warm up an evening when I’m short on time. The soup looks wonderful, but somehow the canned lentils are the most interesting part of this post for me–I had no idea canned lentils existed! Huh! Whadya know? Well if it makes you feel any better, I’ve never made lentil soup either…and I’m kind of obsessed with both lentils AND soup at the moment. This sounds delicious! I love this kind of soups and have made a version of it often, (sometimes with potatoes) but never tried adding chili flakes before. What a good idea. I am currently using the green Tabasco sauce on a lot of things to pep them up. The chipotle version is also good so I will give those two a go in a soup. Thanks for the memory jog. Moosewood is one of my all time favorite cookbooks and I can’t believe I have never tried this recipe. It looks wonderful, and I know that with some cheddar melted on top, even my kids will eat it. My kind of recipe, Jeannette! Thanks for sharing! I have probably told you before and I’ll say it again: I love soup! It’s a mainstay of winter for me…and really, I make and eat soups at any time of the year. If I haven’t said so before, I always just love how you weave the background story behind some of your recipes into these posts (like the aloo gobi curry, and this soup, and other recipes that have memories or meaning). I love love love lentil soup! My Grandma use to make it all the time when we were kids and I couldn’t get enough…thank you for the reminder of how great lentils (and soup) are! I came to lentils quite late in life. I am very smitten and I can always use a new recipe. Spinach and cheese. Eureka! Meister, canned ones are actually okay for quick meals. I used to use them all the time, now I try to cook from dry. The Rowdy Chowgirl, they do exist and are quite common – at least in Canada! What? You keep shocking me, Joanne! Catherine, a version with potatoes would be great. Love the addition of extra spice. Rivki, this isn’t in the Moosewood book – just hastily scribbled on a blank page inside! Enjoy, it’s a good one. Alana, well, hop to it then! Sounds like you need a warm-up, pronto! 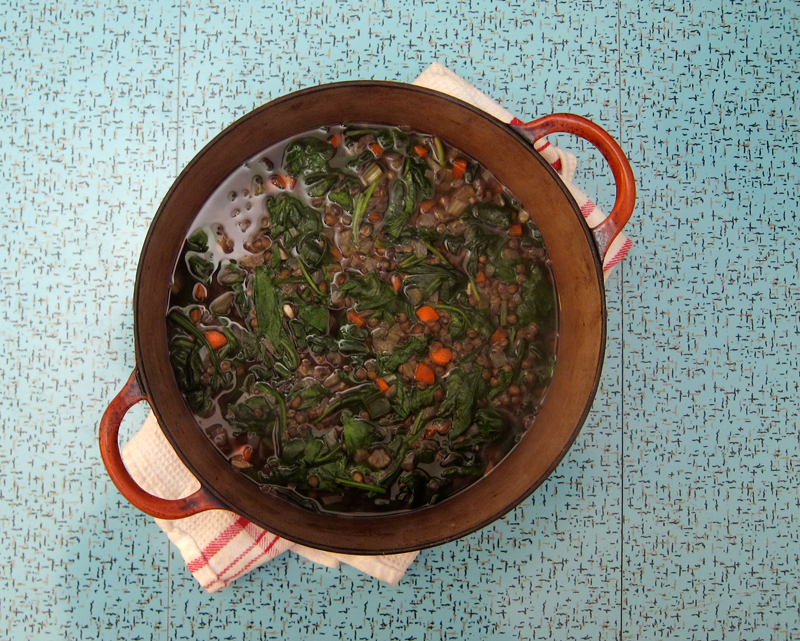 Gia, you can use canned lentils here – I used them all the time when I made this years ago. But for this recipe, I used raw French lentils. Canned makes it quicker, but you can cook them both for the same amount of time and it will work out either way. Enjoy! Thanks Eva, glad to hear! I can’t get enough of Puy lentils! I think they make great ‘salads’ with roasted pumpkin or beetroot, plenty of herbs and goat’s cheese scattered on top. (They seem to have a particular affinity with sherry vinegar as well). Never tried them in soup but this one looks tempting. I love well-worn recipes. And soup… and every ingredient in this soup… win. win… win! Suzy, I agree about puy lentils in salads – they’re great. But I like them in soup too – great texture. couldn’t wait to fix this soup, and was disappointed, very very bland, added more ginger and fresh thym, tried again this morning, and still blah, on the other hand the ‘dal lentils’ were fantastic, mixing the blah soup into the dal, lovely, eating that with bean threads now. Sorry you didn’t enjoy this soup, Christine. It’s nothing fancy and it doesn’t have a lot of spice, so I can see how you found it bland. It works really well with a flavourful stock and I perhaps maybe I enjoy it because it has so many memories attached. Oh well. This soup reminds me of my mom’s soup, except you’ve added more goodies into it. I was raised on rustic Greek lentil dishes like this. Generally my mom would use dry lentils for soup, (but I tend to use canned for convenience), lots of garlic cloves (20+ cloves), a large diced onion, a few bay leaves, olive oil and a few tbs. of tomato paste. When I lived in Greece I tried to recreate my mom’s lentil soup by adding in a diced carrot or a diced potato. That’s what is so great about lentil soup. The skies the limit and so versatile too! I’ve never thought to add fresh spinach before but I’ll keep it in mind for future use. I recently started using lentils du puy. Thank you so much for introducing me to them. I enjoy them, my husband enjoys them and my mom now enjoys them! 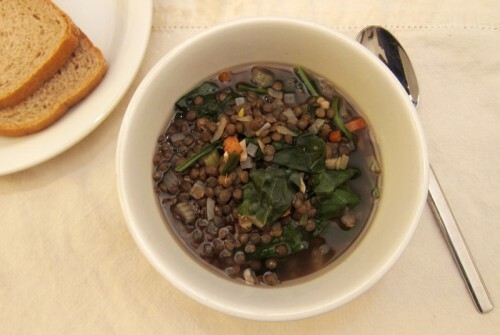 Thanks for this recipe!–I’ve tried other lentil soup recipes, but this one wins “hands down”! Both my 5yo son (not a huge soup eater) and husband (who likes soup, but only *good looking* soups), liked this! I like that it wasn’t really spicy–my son doesn’t like lots of spice; I used only a tiny bit of chili powder instead of the flakes. Jeannette, if you can post approximation of servings, that would be even more helpful. Thanks for your great posts and recipes! I made this for lunch today and it was delicious (with chicken broth instead of vegetable)! Great recipe! Comfort food at its finest my dear! Bijoux, go right ahead with the 20 cloves! That would be so awesome here! Yes, the versatility of this soup is amazing. Made the soup last night and 3 out of 3 folks loooved it! I doubled the recipe, used one part spinach, one part kale and organic veg stock. We topped it with aged cheddar and sided it with hot-out-of-the-oven tea biscuits. YUM! So great to hear, Adventure Nell! Served with tea-biscuits and old cheddar I’m sure this would be a real winner of a meal. I was in a lentil type of mood this weekend and made this for myself and one of my roommates at college. Jeanette, I want to thank you for sharing your time and talents on this blog. I made your soup last night (seems perfect for the stormy weather we are experiencing on the coast at the moment) and received standing ovations from my fans for the result. I love my newly-discovered role as kitchen hero. I have let 25 years of cooking experience slip by as I deferred to my talented husband: he cooked, I reheated leftovers. Pure laziness on my part. So at 50 I am learning to love being in the kitchen. I am surprised at how much I like chopping onions. Very meditative. This soup is a win on all fronts: beautiful, delicious, nutritious, and efficiently made. I used the last of the frozen turkey stock from Christmas. I added two leeks that needed using and served it with crostinis and grated mozza. Very yum. I know I will continue to visit your blog for inspiration and instruction. Again, thanks for being here. Haha, Jan! Spelling corrected 🙂 And I’m so happy to receive your comment – it really brightened up my day! So glad you and your family loved the lentil soup and hooray for learning to love being in the kitchen. Chopping is such a good way to not just reconnect with your food, but it really is a way to get your mind at peace. Thanks for sharing! It was raining today and I’d just bought a fresh bunch of organic spinach from the stand in front of the train station. It was my first time to make lentils (let alone eat lentils though I’d had a bag of dried ones in my cupboard for over a month) and this soup was the most amazing discovery! I only had enough stock for half the liquids, and I added some red pepper flakes to bump up the spiciness. I also added a bay leaf for fun. The soup came out thick and flavourful and just sublime. This is going to be a lifelong rainy-day staple. Thank you so much! Fantastic soup. I used veg soup cubes for the base and added a tablespoon of chili flakes (instead of what I assumed was a teaspoon measure in the recipe) and it’s delicious. Very versatile, I could see adding mushrooms or squash to this soup.